The FV4201 Chieftain was the main battle tank of the United Kingdom during the 1960s, 1970s and 1980s. A development of the Centurion, the Chieftain introduced the supine (reclining) driver position to British design enabling a heavily sloped hull with reduced height. A new powerpack and improved transmission gave it higher speed than the Centurion despite being heavier due to major upgrades to armour protection and the armament: this allowed it to replace both the Conqueror and Centurion while performing their roles effectively. It remained in service until replaced by the Challenger 1 which shared a large number of the Chieftain's features. The Chieftain was an evolutionary development of the successful cruiser line of tanks that had emerged at the end of the Second World War. Its predecessor, the Centurion main battle tank, is widely considered to be one of the most successful of post-war MBT designs. However, the introduction of the Soviet IS-3 /IS-4 heavy tank along with Soviet T-54/T-55 forced the introduction of their own Conqueror heavy tank armed with a 120 mm (4.7 in) gun. A single design combining the firepower of the Conqueror's 120 mm gun with the mobility and general usefulness of the Centurion was seen as the ideal combination. Leyland, who had been involved in the Centurion tank, had built their own prototypes of a new tank design in 1956. Several aspects of the design were trialled by the production of the FV4202 "40-ton Centurion" with a reclined driver position and mantletless gun mounting. In effect, the F4202 was a sightly modified Centurion chassis with a prototype of what would become the Chieftain turret, but armed with the 20pdr gun. This work led to a War Office specification for a new tank. The General Staff specification drew on the experience of Centurion tanks in the Korean War as well as that of the Conqueror tank. The tank was expected to be able to engage the enemy at long range, from defensive positions, and be proof against medium artillery. To this end, the gun was to have a greater angle of depression than the 8 degrees of Conqueror and would be equipped with better frontal armour. The tank was expected to achieve a firing rate of 10 rounds per minute in the first minute and six per minute for the following four. The first few prototypes were provided for troop trials from 1959 which identified a number of changes. Improvements to address engine vibration and cooling resulted in a redesign of the rear hull. This increased the design weight to nearly 50 tons and accordingly the suspension (which had been designed for 45 tons) was strengthened. Trackpads had to be fitted to protect roads from damage and the ground clearance increased. The design was accepted in the early 1960s. Britain and Israel had collaborated on the development in its latter stages with a view to Israel purchasing and domestically producing the vehicle. Two prototypes were delivered as part of a four-year trial. However, it was eventually decided not to sell the marque to the Israelis (since, at that period of time in the late 1960s, the UK was more friendly towards the Arab states and Jordan than to Israel), which prompted them to follow their own development programme. In 1957, NATO had specified that its forces should use multi-fuel engines. The early BL Engine delivered around 450 bhp (340 kW) to the sprocket, which meant a top road speed of around 25 mph (40 km/h) and cross-country performance was limited. This was further hampered by the Horstmann coil spring suspension, which made it a challenge to drive cross country and provide the crew with a comfortable ride. Due to the cylinder linings being pressure fitted, coolant leaks within the cylinder block were common, resulting in white smoke billowing from the exhaust. In the late 1970s, engine design changed with the introduction of Belzona which was used to improve the lining seals. Engine output also increased, with later engines delivering some 850 bhp (630 kW) to the sprocket. This meant better performance and an increased speed. However, cross-country performance remained limited. The design of the Chieftain included a heavily sloped hull and turret which greatly increased the effective thickness of the frontal armour – 388 mm (15.3 in) on the glacis (from an actual thickness of 120 mm (4.7 in)) and 390 mm (15.4 in) on the turret (from 195 mm (7.7 in)). It had a mantletless turret in order to take full advantage of reclining the vehicle up to ten degrees in a hull-down position. For security reasons early prototypes had a canvas screen covering the mantlet and a sheet metal box mounted over the sloping glacis plate to disguise the configuration of the vehicle. The driver lay semi-recumbent in the hull when his hatch was closed down which helped to reduce the profile of the forward glacis plate. The commander, gunner and loader were situated in the turret. To the left side of the turret was a large searchlight with infra-red capability in an armoured housing. A Leyland L60 engine pack displayed at the Bovington tank museum. The complete unit could be removed by the crane of the FV434. The Leyland L60 engine is a two-stroke opposed piston design intended for multi-fuel use so that it could run on whatever fuel was available. In practice the engine did not deliver the expected power and was unreliable, estimated to have a 90% breakdown rate but improvements were introduced to address this. Primary problems included cylinder liner failure, fan drive problems and perpetual leaks due to vibration and badly routed pipework. However, as the engine power improved the tank itself became heavier. The tank was steered by conventional tillers hydraulically actuating onto external brake discs. The discs worked via the epicyclic gearbox providing "regenerative" steering. The Merritt-Brown TN12 triple-differential gearbox was operated motorcycle-style with a kick up/kick down "peg" on the left, which actuated electro-hydraulic units in the gearbox, the accelerator cable was operated by the right foot. In the turret, the loader was on the left and the gunner on the right of the gun with the commander situated behind the gunner. The suspension was of the Horstmann bogie type with large side plates to protect the tracks and provide stand-off protection from hollow charge attack. The main armament was the 120 mm L11A5 rifled gun. This differed from most contemporary main tank armament as it used projectiles and charges that were loaded separately, as opposed to a single fixed round. The charges were encased in combustible bags. Other tank guns such as the 120mm L1 gun on the Conqueror, needed to store the spent shell cartridges or eject them outside. The combustible charges were stored in 36 recesses surrounded by a pressurised water/glycol mixture – so-called "wet-stowage". In the event of a hit penetrating the fighting compartment, the jacket would rupture soaking the charges and preventing a catastrophic propellant explosion. As there was no shell case, the firing of the charge was by vent tubes automatically loaded from a ten-round magazine on the breech. Due to the length of the gun, which required balancing, and the need for storage space, the turret has a large overhang to the rear. This contains radios, ammunition and fire control equipment and has further stowage externally. The gun could fire a wide range of ammunition but the most commonly loaded types were high explosive squash head (HESH), armour-piercing discarding sabot (APDS), or practice round equivalents for both types. The Chieftain could store up to 64 projectiles (though a maximum of 36 APDS, limited by the propellant stowage). The gun was fully stabilised with a fully computerized integrated control system. The secondary armament consisted of a coaxial L8A1 7.62 mm machine gun and another 7.62 mm machine gun mounted on the commander's cupola. An advantage of using two-part ammunition was that in the case of inert rounds like APDS the loader could reach for the next round and hold it in his lap, ready to load while the gunner was acquiring the target and firing. This practice increases the rate of fire but would be hazardous with one-piece ammunition. Chieftain had an NBC protection system which Centurion lacked. The initial Fire-control system (FCS) was the Marconi FV/GCE Mk 4. A .50-inch (12.7 mm) ranging gun was mounted above the main gun (with 300 rounds available). This fired ranging shots out to a maximum of 2,600 yards (2,400 m), at which point the tracer in the ranging rounds burned out although the high explosive tip still created a visible "splash" on impact. The tank commander had a rotating cupola with nine vision blocks -giving all round view, plus the 7.62 mm machine-gun and an infrared (IR) capable projector coaxial with the weapon. The aiming systems were provided for both the gunner and the tank commander; they had 1x or 10x selectable magnification power, increasing to x15 in the Mk5 and beyond, and they were replaceable with IR vision systems for night operations (3x magnification power). The commander could rotate his cupola to bring his sight onto a target and then engage the mechanism that brought the turret round on to the correct bearing so that the gunner could complete the aiming. The commander's controls had over-ride capability on those of the gunner. The left side of the turret had a large searchlight with an electrically controlled infra-red filter inside an armoured box, with a relatively long range – up to 1–1.5 kilometres (0.62–0.93 mi). From the beginning of the 1970s, the Mk 3/3 version replaced the ranging gun with a Barr and Stroud LF-2 laser rangefinder with a 10 km (6.2 mi) range. This allowed engagements at much longer ranges, and also could be linked to the fire control system, allowing more rapid engagements and changes of target. On later models, fire control was provided by the Marconi IFCS (Improved Fire Control System), using a digital ballistic computer. The upgrade was not finished until the end of 1980, when some examples (but not the majority) had the IR searchlight replaced with TOGS. Many later examples had Stillbrew armour, intended to defeat Soviet 125 mm tank guns and heavy anti-tank missiles. These became the Mark 13 version. Chieftain tanks of 14th/20th King's Hussars on parade with urban camouflage, Straße des 17. Juni, West Berlin, 18 June 1989. Chieftain equipped British units of the British Army of the Rhine (BAOR) during the Cold War defending West Germany against possible Warsaw Pact attack. 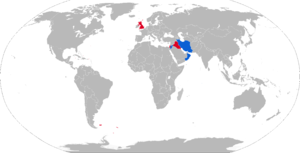 Like its European competitors, Chieftain found a large export market in the Middle East, but unlike Centurion, it was not adopted by any other NATO or Commonwealth country. Chieftain proved itself capable in combat and able to be upgraded, both for overall improvement and to meet local requirements. It was continuously upgraded until the early 1990s, when it was replaced by Challenger 1. The final Chieftain version, which was used by the British Army until 1995, incorporated "Stillbrew" armour named after Colonel Still and John Brewer from the Military Vehicles and Engineering Establishment (MVEE), the Improved Fire Control System (IFCS) and the Thermal Observation Gunnery Sight (TOGS). The last British Regiment equipped with Chieftain was the 1st Royal Tank Regiment, which was based at Aliwal Barracks, Tidworth. The first model was introduced in 1967. Chieftain was supplied to at least six countries, including Iran, Kuwait, Oman and Jordan. An agreement for sales to Israel and local production was cancelled by the British Government in 1969, despite considerable Israeli technical and tactical input into the development of the tank, especially the capacity to operate successfully in desert environments, and the provision for the tank to make good use of hull-down positioning. Two examples were delivered to and extensively trialled by the Israeli Armoured Corps. This experience spurred the creation of the indigenous Israeli Merkava, the development programme of which was led by General Israel Tal, who had worked closely with the British in the Anglo-Israeli Chieftain project. The largest foreign sale was to Iran, which, at the recommendation of General Tal, took delivery of 707 Mk-3P and Mk-5P (the letter P standing for Persia), as well as 187 FV4030-1, 41 ARV and 14 AVLB before the 1979 revolution. Further planned deliveries of the more capable FV4030-2 (Shir 1) and FV4030-3 (Shir 2) series were cancelled at that point. It was in the Middle East that the Chieftain was to see all of its operational experience. First, it was used extensively by Iran during the Iran–Iraq War of 1980–88, including the largest tank battle of the war, with mixed results as the Chieftain Mk 3/5 suffered from chronic engine problems and low power-to-weight ratio, making the Chieftain unreliable and slow when manoeuvring over harsh terrain, which in turn made it prone to breakdowns in the midst of battle or a sluggish target and thus vulnerable to enemy tank fire. Out of the 875 Chieftain tanks that had started the war only 200 were left. The Chieftain remains in service in Iran, the Mobarez tank being a locally upgraded version. Kuwait had 143 Chieftains on the eve of the 1990 Iraqi Invasion of Kuwait. Thirty-seven Chieftains of the Kuwaiti 35th Armored Brigade fought at the Battle of the Bridges against elements of the Iraqi Hammurabi and Medina divisions before withdrawing over the Saudi border. None of the brigade's tanks were lost in the battle, and the 35th Armored Brigade (known as Al-Fatah) became part of Joint Command Forces East during the 1991 Gulf War and was able to return into Kuwait undefeated. The rest of the Kuwaiti Chieftains were either destroyed or captured. After the liberation of Kuwait, the ageing Chieftains were replaced by the Yugoslav M-84. Rate of fire: 10 rounds per minute for the first minute and 6 thereafter. Mark 1 and Mark 2 models had a coaxial Browning .50-inch (12.7 mm) ranging machine guns prior to the introduction of the laser rangefinder. Test vehicle built by Leyland Motors using Centurion components to test reclining drivers position and mantlet-less turret proposed for FV4201. One built, 1956, official specification for FV4201 issued August 1958. In 1975 all earlier Marks of tanks except Mark 1's were upgraded to Chieftain Mk.5 standard as part of the 1975 "Totem Pole" programme,[xvi] including addition of Clansman radios, fitting of TLS, fitment of Muzzle Reference System (MRS) [xvii] upon replacement of L11A3 barrel with L11A5 barrel,[xviii] and fitment of 750 hp L60 Mark 8A. These vehicles were re-designated Chieftain Mk's.6 to Mk.8. Chieftain Mk.6 after completing all phases of "Totem Pole", 1979. Proposed further upgrades, cancelled when the Challenger 1 was introduced. Armoured Recovery Vehicle, Armoured Recovery and Repair Vehicle. An AVRE carrying fascine on Salisbury Plain. Armoured Vehicle Royal Engineers, twelve early "Willich Chieftain AVRE" vehicles converted by 32 Armoured Engineer Regiment and 21 Engineer Base Workshop of the Royal Engineers, Willich, 1987, remaining 48 ex MBTs converted by Vickers Defence Ltd, 1991, to be a British Army combat engineering variant used by the Royal Engineers. Self-propelled anti-aircraft gun version, equipped with the Marksman twin gun turret. Twin 30 mm AA turret. Also known as "4030 Phase 2 Jordan". Jordanian with the running gear of the Challenger 1. 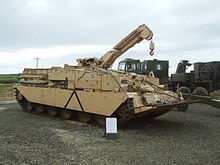 In essence, this was a transition vehicle from the Chieftain to the Shir 2, which had been intended for Iran but was subsequently cancelled. The vehicle chassis comprised the front half of a Chieftain hull, Chieftain running gear and the rear of a 4030/2 Chassis (Sloping Hull). This allowed the fitment in the engine bay of a Rolls-Royce CV12 engine producing 1200 bhp at 2,300 rpm. The Chieftain chassis was adapted to mount air defence weapons ("Marksman" 2 x 35 mm cannon) and a 155 mm howitzer in a number of variants. Iranian upgraded version of Chieftain. Iran: 707 Mk-3P and Mk-5P, 187 FV4030-1, 41 ARV and 14 AVLB obtained before the 1979 revolution. Further planned deliveries of the more capable FV4030-2 (Shir 1) and FV4030-3 (Shir 2) series were cancelled at that point. 100 in service as of 2005[update]. (100 in 1990, 250 in 1995, 140 in 2000). United Kingdom: Used from 1965 to 1995. Kuwait: 175 in 1976, 143 in 1989, 20 in 1995, 17 in storage in 2000. Iraq: 50-75 tanks, captured from Iran, in service with Iraqi Army in 1990. Most upgraded to Khalid-level, with air-conditioning for the crew and reinforced armour and night vision. Israel: 2 delivered for the joint Anglo-Israeli developmental project. In Israeli Armored Corps service for trials 1965–69. Netherlands: One Chieftain was tested alongside a Leopard between 15 January and 22 March 1968 by the Detachement ter Beproeving van Voertuigen (“Detachment for Testing of Vehicles”) of the Royal Netherlands Army; the tank was allocated British registration number 03 EB 81 and Dutch number KZ-99-65. The Leopard was eventually selected largely because of the Chieftain's poor construction quality, especially the engine, which leaked so much oil that the engine compartment turned black. ^ Note: engine horsepower ratings are net, the gross (SAE) figures are approximately 100 hp higher. ^ Note: all variants of the L60 were interchangeable and could be fitted to any Mark of vehicle. Vehicles at the factory were fitted with the latest variant of L60 with earlier vehicles in service being upgraded to the current L60 variant as soon as sufficient numbers of the later engine variant became available, the removed earlier engines then being rebuilt to the current L60 standard where possible. Changing an engine usually took around 1.5 to two hours. ^ Note: the original design had the engine exhaust silencers mounted internally at the rear of the engine compartment however a re-design of the TN12 transmission resulted in an increase in gearbox length and necessitated the transfer of the exhaust silencers to an external armoured box at the rear of the hull. ^ Note, in an attempt at reducing the overall height of the vehicle the original design used road wheels of a smaller diameter which gave insufficient ground clearance. They were later replaced with road wheels of the same diameter as used on the Centurion and by careful re-positioning of their mountings along with adjustment of the idler and final drive mountings resulted in a vehicle height only 1" higher than with the original smaller wheels. ^ Note; these and other modifications had been initially trialled on Prototype vehicles before the MK.1 design had been frozen for production. ^ Note; vehicle speeds are governed. ^ Note: this engine was a three-cylinder opposed-piston two stroke diesel of 1 litre capacity. Its purpose was to drive a 24 volt generator to provide electrical power when the main engine was not running. ^ Note; ranging gun effectiveness improved to 2,500 metres range. All service Chieftains were subsequently upgraded with the LF2 laser range finder with ranging out to in excess of 5,000 metres. Vehicles upgraded with the LF2 TLS had an "L" suffice appended to the Mark No. ^ Note; this allowed the tank commander to fire the main gun and was subsequently fitted to all service Chieftains. ^ Note; upon fitment of the Tank Laser Sight (TLS) the designation changed to Mk.5/L. ^ Note; upon fitment of the TLS the designation changed to Mk.6/L. ^ Note: "Exercise Totem Pole" was carried out in six-to-nine phases depending on the Mark of vehicle being modified (Chieftain Mk.5's already had some of the required changes incorporated at the factory) between 1975 and 1979 and included fitment of the Marconi Improved Fire Control System (IFCS), replacement of the searchlight with the Barr & Stroud Thermal Observation Gunnery System (TOGS), along with modifications for using FSAPDS ammunition. Upon completion of each phase the vehicle received an additional suffix to the designation, e.g., "Chieftain Mk.3/S(Y)2" denoting a Mark 3/S having completed the first three phases of "Totem Pole". ^ Note; the Muzzle Reference System uses a laser beam reflected from a mirror at the muzzle to measure minute dimensional changes in the barrel due to temperature, humidity, etc., which are then compensated-for in the Fire Control System. The thermal sleeve had originally been developed to minimise such dimensional changes in the barrel which have an increasing effect on gun accuracy as ranges are increased. ^ Note; barrels became worn and needed replacement after firing a specified number of rounds during accumulated practice shoots. ^ Note; upon fitment of the TLS the designation changed to Mk.7/L. ^ Note; upon fitment of the TLS the designation changed to Mk.8/L. ^ Note; "Exercise Sundance" concerned improvements in engine power, reliability, and other power train improvements, and was carried out in five main phases between 1976 and 1979. These, in themselves, had been preceded by "Dark Morn", "High Noon", and the initial "Fleetfoot" engine development programme which had completed in October 1971. Vehicles on which "Sundance" modifications had been carried out received an additional 'Z' suffix appended to their designations. ^ Note; Stillbrew was additional armour added to increase turret frontal protection against HEAT rounds, specifically, the improved variants of the Soviet-made RPG-7, etc., and consisted of conventional steel armour mounted on rubber pads to prevent vibration. The "Stillbrew" name is derived from the names of the developers, Col. Still, and John Brewer, of the Military Vehicles and Engineering Establishment. ^ Anthony Tucker-Jones, "Armoured Warfare in the Korean War", Casemate Publishers, 2013, p. 61. ^ Simon Dunstan, "Centurion Universal Tank 1943-2003", Osprey Publishing, 2003, p. 3. ^ Chris Bishop, "The encyclopedia of modern military weapons", Barnes & Noble Books, 1999, p. 30. ^ Carter Malkasian, "The Korean War 1950-1953", Taylor & Francis, 2001, p. 52. ^ "Israel and Depleted Uranium". Salem-News.Com. 13 May 2010. Retrieved 26 November 2013. ^ a b c d "The Knight That Gave Birth To The Chariot". Armored Corps Magazine. Retrieved 26 November 2013. 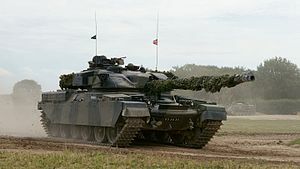 ^ "House of Commons Will Hold Debate on Issue of Sale of Chieftain Tanks to Libya". Jewish Telegraphic Agency. 17 June 1969. Retrieved 26 November 2013. ^ "HowStuffWorks "Chieftain Main Battle Tank"". Science.howstuffworks.com. 20 November 2007. Retrieved 26 November 2013. ^ Nicholas Moran (26 August 2014). Inside the Chieftain's Hatch: Snapshots - Chieftain. World of Tanks. Event occurs at 4min 10sec. Retrieved 10 November 2015. ^ "Middle East | Files reveal British-Israel tank secrets". BBC News. 2 January 2003. Retrieved 26 November 2013. ^ Cordesman, Anthony H. (1 April 2018). "Iran's Developing Military Capabilities". CSIS. Retrieved 1 April 2018 – via Google Books. ^ Dunstan, Simon (20 September 2012). "Chieftain Main Battle Tank 1965–2003". Bloomsbury Publishing. Retrieved 1 April 2018 – via Google Books. ^ John Pike (21 March 2013). "Iranian Ground Forces Equipment". Globalsecurity.org. Retrieved 26 November 2013. ^ John Pike (22 April 2013). "Kuwait – Army Equipment". Globalsecurity.org. Retrieved 26 November 2013. ^ "Landmacht beproeft tanks op Leusderheide" (in Dutch). Retrieved 20 December 2017. ^ Smit, Willem (2008). De Leopard 1: Gepantserde vuist van de Koninklijke Landmacht [The Leopard 1: Armoured fist of the Royal Netherlands Army] (in Dutch). The Hague: Netherlands Institute of Military History. pp. 25–31. Wikimedia Commons has media related to Chieftain tanks. This page was last edited on 5 April 2019, at 19:20 (UTC).